Over the last few days I’ve thought a lot about Haiti, El Salvador, and the African countries. I’ve wondered what the people of those countries are feeling. I’ve wondered what they are thinking about themselves and about America. I’ve also thought a lot about Nazareth. It probably wasn’t a whole lot different from those countries. Over the last few days I’ve thought a lot about our president and Nathanael. “Why are we having all these people from [those] countries come here?” “Can anything good come out of Nazareth?” They are asking the same question. I want to be clear about this. I am not talking about only or even primarily the president or Nathanael. I’m also talking about us, you and me. Over the last few days I thought a lot about my Nazareths; the people, places, and situations that I had no right to judge, question, or label but I did, and sometimes still do. I’ve wondered about the ways I’ve belittled, demeaned, and rejected the Nazareths in my life. I am sure I lost more by their absence from my life than they would have gained by my presence in theirs. And I wonder how many times I have missed the Messiah’s presence because I refused to look toward Nazareth. What about you? Who or what are your Nazareths? Recall their names. Picture their faces. What has been or is your relationship to them? We all have Nazareths in our lives. They are the objects of our judgments, assumptions, labeling, and exclusion. They are the people, places, and situations from which we neither expect nor see the possibility of anything good coming, certainly nothing useful or beneficial to us. Nazareth is about how we see and relate to others, whether in foreign policy or in our own homes. Nathanael’s question is not unique to him. It gets asked every day. Current versions of his question might go something like this. Can anything good come out of El Salvador, Haiti, or African countries? Can anything good come out of Washington? Can anything good come out of Islam? Can anything good come out of the immigrant, the foreigner, the stranger? Can anything good come out of the Black Lives Matter or the Me Too movements? Can anything good come out of the people and relationships that have hurt me? Can anything good come out of the broken, difficult, or painful places in our lives? Can anything good come out of the parts of ourselves that we dislike and reject? I suspect we could all name at least one individual or group of people about whom we ask that question. Nathanael’s question, however, isn’t really about Nazareth. It’s about Nathanael. That’s true for all of us whoever or whatever our Nazareth might be. That question says more about us than it does Nazareth. It is about our beliefs and unbeliefs in others, ourselves, and God. It’s about our biases, prejudices, and fears. It’s about our wounds, losses, and sorrows. It’s about our guilt and shame. It’s about the assumptions and judgments we make. It about all the many filters through which we see the world, others, ourselves, and God. Somehow we become convinced that we know what Nazareth is like and we’re sure there’s no way anything good, let alone the holy one, the Messiah, could come from there. But what if that’s exactly how it is? What if God reveals God’s self through the one who is different, the other, the stranger? What if God comes to us as one who has no economic value, is powerless, and has no place to lay her or his head? For us Nazareth is a blind spot and a hardening of our heart. For God, however, Nazareth is a place of epiphany, a place where God shows God’s self and invites us to see, to believe, and to love in new ways. Isn’t that what happened for Nathanael in today’s gospel (John 1:43-51)? He didn’t declare Jesus to be “the Son of God” and “the King of Israel” because Nazareth had changed but because he had changed. And I don’t think he made those declarations because Jesus had some supernatural or clairvoyant power by which he saw Nathanael under the fig tree. No, this was an epiphany for Nathanael, a recognition that God was in a place and a person that Nathanael never expected possible. I don’t know how that happened for Nathanael. I only know that he was willing to get up and leave where he was. He let go of one belief to hold a new belief. He walked away from the fig tree of his assumptions to consider something new. He left behind his certitudes about Nazareth to give his attention to something different, something foreign and unexpected. Nazareth isn’t about a past wrong, gaining the upper hand, a religion, a race, a nationality, a sexual orientation, an economic or immigration status but about Emmanuel, God with every human being regardless of who they are or where they come from. Nazareth is real. It is flesh and blood real. It’s the recognition that your flesh and blood; my flesh and blood; the flesh and blood of Haitians, Salvadorans, and Africans; the flesh and blood of our president; the flesh and blood of Nathanael; and the flesh and blood of Jesus are all the flesh and blood of God. And maybe that’s the challenge and difficulty of Nazareth. Sometimes it’s so ordinary and so much like every day life that we just don’t see it. We miss it. Other times it hits so close to home and asks so much of us that we refuse to see it. We close our eyes and turn away. Regardless, for every one of our Nazareths there is always an invitation to “come and see.” It’s the invitation to get up and move to a new place, to leave behind our assumptions and judgments, to give up our certitudes, to risk not knowing, to see with the eyes of our heart, and to let ourselves be surprised by God. It’s the invitation to let ourselves be changed; to see, believe, and love in new ways. It’s a space in which we are given the freedom to choose to believe or not to believe – in God, in another, and in ourselves. That choice is always before us. It’s a choice we make every time we see the face of another or look in the mirror. It’s a choice we make every time we hear the news or read the headlines. It’s a choice we make every time we encounter the stranger, the one is different. It’s a choice we make every time we look out on the world from beneath our own fig tree. 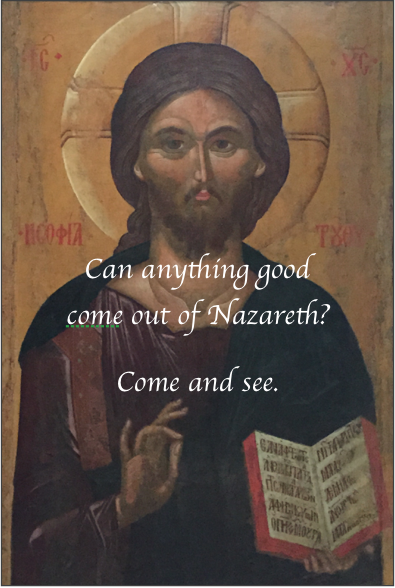 Can anything good come out of Nazareth? I can’t answer that question for you and you can’t answer it for me. Philip could not answer it for Nathanael. Neither could Jesus. If we really want to know the answer to that question then we must each get up and go see for ourselves. Nathanael did and it changed his life forever. That’s the promise for us too. What about you and me? Can anything good come out of our Nazareth? Come and see. Good food for thought, Father Mike. I’m reminded of a phrase I heard a long time ago that goes something like this “our church is where the gospel fuels our journey.” Your message on my “Nazareths” is my fuel for the journey. Lots to pray on and think about. Grateful that you continue to share your message with the world. Thank you Anne. I know I was talking to myself as much as to anyone else. Thank you also for the full image. I am glad the message was full for you; your comment is for me. Thank you for this powerful reminder to look in the mirror. It is too easy to look outside oneself and so hard to look inside to where the heart is. With gratitude for your insights, honesty and sincere listening to the small quiet voice..
Diana, you are so right about how hard it is to look within and face ourselves, and especially to do so with hope and change rather than guilt and self-condemnation. Thank you for your comment and for reading my blog. I love the way you help bring the bible alive for me. Thank you! Lawrence, I suspect this was for me as much confession as sermon. I can get pretty comfortable under my fig tree. St. Francis’ prayer is a wonderful response to our Nazareths. Thank you for that. Thinking about my own Nazareth’s. WOW!! WOW!! I have read this gospel many times and never saw this. Thank you soooo much for pointing it out to me. I have been a Nathanael and didn’t realize it. Thank you thank thank you for posting your messages. THANK YOU. Thanks Richard for reading my blog. I suspect we are all Nathanael at times. I know I am. Fr. Mike, you continue to make alive and totally current the gospel, scripture with your incisive and insightful calls to our own accountability and prayer! Thank you so very much! I get comfortable under my fig tree, too. Thanks Jan. I hope you all are well. Reading this from Sydney Australia Father Mike. Thanks Nora. I am glad to hear from you and I appreciate you reading my blog.